This notice is designed to help you understand what cookies are, how Colourful Coffins uses them and the choices you have in regards to their use. To allow you to securely sign in to your Colourful Coffins Account, so that you can use "My Account" features such as order information, making payments and viewing statements. To record the areas of the Site that you have visited, products you have viewed and time spent browsing, as well as the products you purchased. 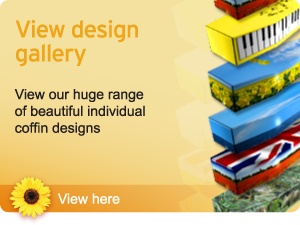 Colourful Coffins uses this information to help make the website more user friendly, develop our Site design and to continuously improve the quality of the service we provide. Cookies are an essential part of how our Site works, as they remember certain information about a visitor. Colourful Coffins uses First Party cookies (these are placed there and used solely by Colourful Coffins) and Third Party cookies (these are placed there by third parties we work with). Colourful Coffins allows selected Third Parties who participate with us in marketing programs to place cookies when you visit our site. These cookies enable us to monitor which adverts you see and click on to get to our site. For details of the Third Party cookies we use please see the table below. Colourful Coffins is not responsible for the content or privacy policies of Third Parties or other websites, and we advise that you check these yourself. Data Protection Officer, Printworks, Crescent Road, Cowley, Oxford, OX4 2PB, or via enquiries@colourfulcoffins.com quoting Security and Privacy Enquiry.